While many see deforestation as a threat, NASA has revealed that the Earth is greener than it was 20 years ago. A series of high resolution pictures of Earth collected over the course of 20 years have returned astonishing results. 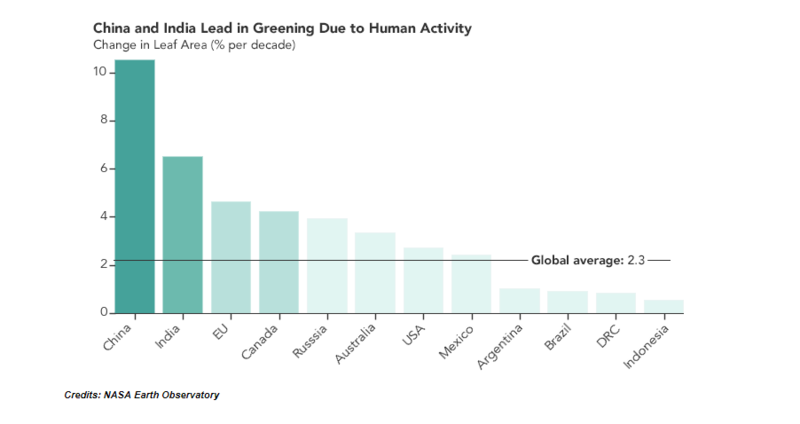 While many were worried that human activity had lead to massive deforestation, certain human activity has lead to there being more vegetation today than in the mid-90s. The data was collected by instruments on board two satellites that had been orbiting Earth for two decades, capturing four images of every location on the planet everyday. According to a report published in the journal Nature Sustainability on February 11, there’s fresh greenery the size of the entire Amazon rain forest, and it’s mostly thanks to China and India. It all started in the late 80s, when both China and India realized that the quality of air and soil was decreasing drastically, and that they needed to fight if they wanted to sustain the world’s two biggest populations. China started mass tree planting programs and intensive agricultural projects. Today, 42% of China’s greenery are the result of these programs, and 32% of their crops are a result of their agricultural programs. Further down the border in India, 832% of their greenery is is a result of food cultivation programs, which were launched to help secure food to their 1.3 billion people. In China alone, the production of grains, vegetables and fruits has increased between 35% and 40% since the beginning of the millennium. However, this transformation does not make up for the losses in terms of flora and fauna species that the world has lost in recent decades. We still need to preserve natural habitats to indigenous plants and animals all over the plant.